Eternal. Nihilist. Madman. Would-be lover of Death itself. Thanos of Titan is all these things — and even before he created the Infinity Gauntlet and decimated half the universe, he was still a mighty force to be reckoned with. 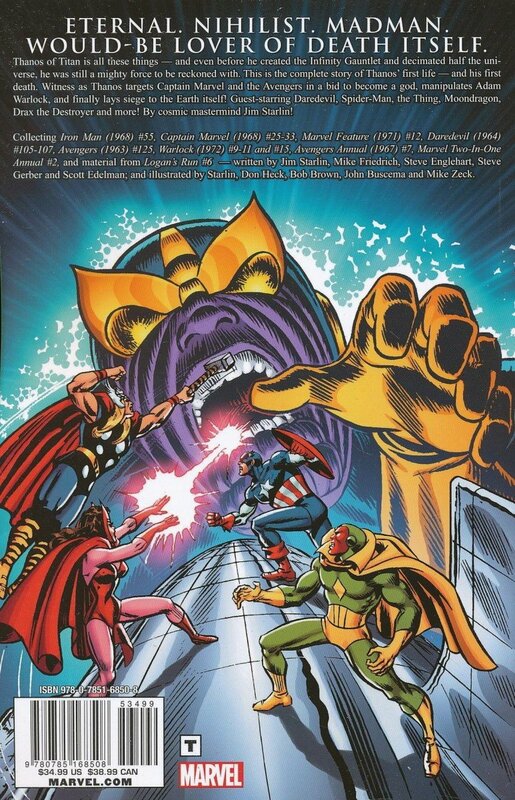 Here, collected in one volume for the first time, is the complete story of Thanos’ first life — and first death. Witness as Thanos targets Captain Marvel and the Avengers in a bid to become a god, manipulates Adam Warlock, and finally lays siege to the Earth itself! Guest-starring Daredevil, Spider-Man, the Thing, Moondragon, Drax the Destroyer and more! By cosmic mastermind Jim Starlin! Collecting IRON MAN (1968) #55, CAPTAIN MARVEL (1968) #25-33, MARVEL FEATURE (1971) #12, DAREDEVIL (1964) #105-107, AVENGERS (1963) #125, WARLOCK (1972) #9-11 and #15, AVENGERS ANNUAL (1967) #7, MARVEL TWO-IN-ONE ANNUAL #2, and material from LOGAN’S RUN #6.